The audio industry recognizes that if digital processing technology is to become the standard for the mixing of live sound, the consoles are going to have to get smaller, cheaper, easier to build, and easier to run. Suddenly, small is beautiful. It’s against this backdrop that DiGiCo launched its SD8 a couple of months back. Since the official unveiling in September, the board has been named Best Sound Product Of The Year at LDI and Most Innovative Product In The Live Industry at the SIEL tradeshow in Paris. The company shipped 75 consoles in October alone, barely two months after completing its initial, pre-production run. Other console manufacturers have found—to their cost—that while it may make sense on paper to outsource the production of smaller, cheaper desks to China, such a move carries with it the risk that the fruits of your R&D labor will be meticulously reverse-engineered and illegally copied. That’s one reason why DiGi-Co is building the SD8 on a dedicated production line at its plant in Glenrothes, Scotland. The area is better known for golf and malt whisky and seems, on the face of it, an unlikely place to be building state-of-the-art audio hardware. Yet over the past two decades, the region has become something of a center for hi-tech innovation, earning itself the nickname ‘Silicon Glen’. Companies such as DiGiCo are spoiled for choice when it comes to sourcing specialist services such as high-density PCB assembly from third-party manufacturers located nearby. Webster added that the company’s D5 live mixing console, still a favorite among sound engineers the world over, uses 39 SHARC processors, while the SD8 requires only a single TigerSHARC for what amounts to about 90 percent of the power. 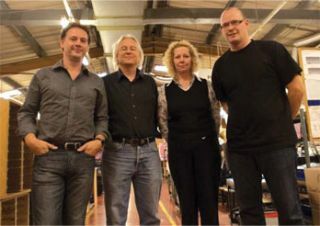 He reveals that DiGiCo’s technical director, John Stadius, began working on the technology behind the SD series six years ago and that, although the first console in the line—the SD7—only saw the light of day in 2007, the nature of FPGA makes future product development more straightforward. As well as enabling greater processing power, DiGiCo’s use of Tiger-SHARC processors also puts that power on a smaller footprint—a vital issue for concert venues wanting to maximize revenue by installing extra seats, for example. The company’s PCB designs use three different kinds of component packaging: traditional through-hole soldering, surfacemounting, and ball-grid arraying for the Tiger SHARCs. All this clever engineering under the hood would be meaningless, of course, if the face the SD8 presents to the outside world were not suited to its role in life. The console may offer up to 60 mono or stereo channels—the equivalent of 120 channels on a DSP-based device—in an appealingly compact package, but that package still needs to be affordable and usable.